‏The name שָׂטָן ‎ śāṭān—is mentioned 19 times in the Old Testament, 14 times in the book of Job, the oldest book in the Bible. In this book we see satan, as an adversary of Job, attempting to discredit God’s assessment of Job’s character. The name Σατάν Satan or Σατανᾶς Satanas—is mentioned 37 times in the New Testament. The most notable occurrences are when he attempts to persuade Jesus to follow in the steps of the first Adam in Matthew 4 and Mark 1, when he uses Peter, to try to persuade Jesus to avoid the cross in Matthew 16, and when he enters Judas in John 13:22-17 at the last supper, resulting in the betrayal of Jesus. In all of these accounts satan is clearly an enemy and opponent. In the Hebrew and Greek definitions of his name, his adversarial nature is further revealed. But what power does he have in the world and over us? Scripture identifies two groups of people in the world. Those who are believers and for God and those who are unbelievers and against God. Satan’s power is contingent on which group people belong to. Colossians 1:13 As believers we are no longer under the rule of Satan but we are vulnerable to the temptation of sin. This relegates his power over us to that which we give him when we choose to do so. Most of the enemies attacks against believers comes in the from of trials and trouble God allows. It is in these times we are most vulnerable to temptation. Again in Mere Christianity C.S. Lewis follows up on the idea that a rebellion is in progress with this thought “Christianity is the story of how the rightful king has landed, you might say landed in disguise, and is calling us all to take part in a great campaign sabotage”. 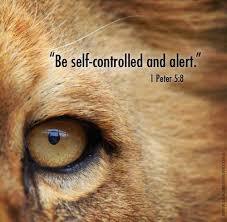 Be alert: Being spiritually alert and aware that”things are not what they seem”. Many believers are caught off-guard because they are spiritually lazy, neglecting prayer and studying the Word. We should especially be alert for false teachers that seek to present a false Gospel. The book of Jude 1 has a lot to say about this. Resist him: Standing firm in the faith 1 Corinthians 16:13; 1Peter 5:9 even when it is not popular, even when it is counter-cultural. The popularity, tolerance, and acceptance that Christianity has enjoyed is fading fast in our post-modern world. We face an enemy who is dangerous, and cunning, but he has been defeated! God is Sovereign and will have the last word in everything! Thank you for the encouragement. I am glad it spoke to you.